So it is now officially October. Just under 3 months of 2013 left. How scary. I've decided that I will be starting all my Christmas shopping early this year. Purely for the reason that I ALWAYS leave it very last minute. When I say last minute I'm talking a week before when the shops are packed, everything is a mess and it's just a nightmare. I pretty much know what my family members want this year so I'll be able to order everything in advance. Anyway enough about Christmas. Today I thought I'd tell you about a product I bought last week and that is the B.Pure Micellar Water. Now these have taken the beauty community by storm this past year, mainly due to Bioderma which I won't lie, I haven't actually used. I know bad beauty blogger. When I eventually do try it I will be sure to let you all know. I was shopping in Superdrug a couple of weeks ago and spotted this at the counter where you pay. Instantly intrigued and drawn in by the price tag I thought why not and got the salesgirl to run it through the till as well. I must say I have been very impressed so far. 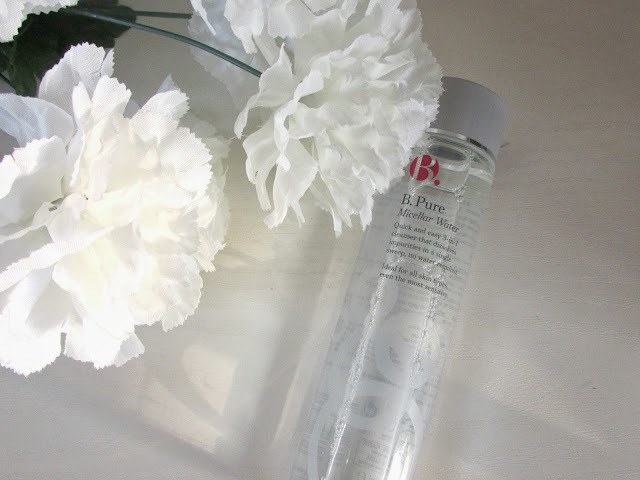 The whole idea of micellar water is too basically remove all make up and dirt on your face. However it doesn't involve all the harsh scrubbing that is normally involved and is very gentle on your skin. 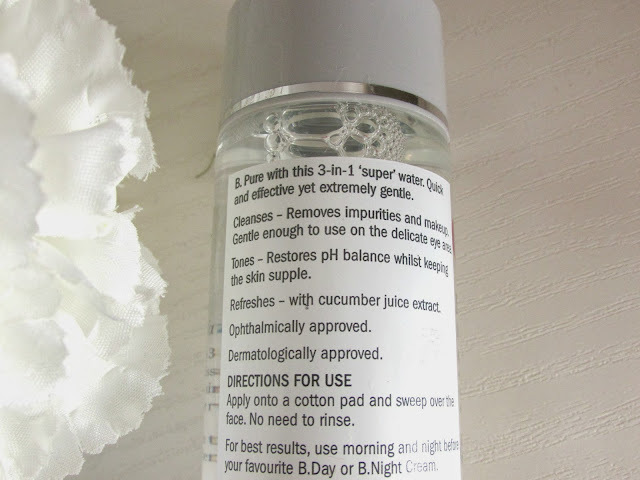 The main thing that I love about this product is that it is a 3-in-1 which is perfect if I have had a long day and don't really want to spend a lot of time on my skin. When it comes to cleansers and toners etc I absolutely hate it if they are oil based and you can imagine my delight when I found out this wasn't. It cleanses the skin by removing make up and other impurities on your face. Because this product is so gentle you can use it near the eye area as well which is perfect as you don't need to worry about it stinging. 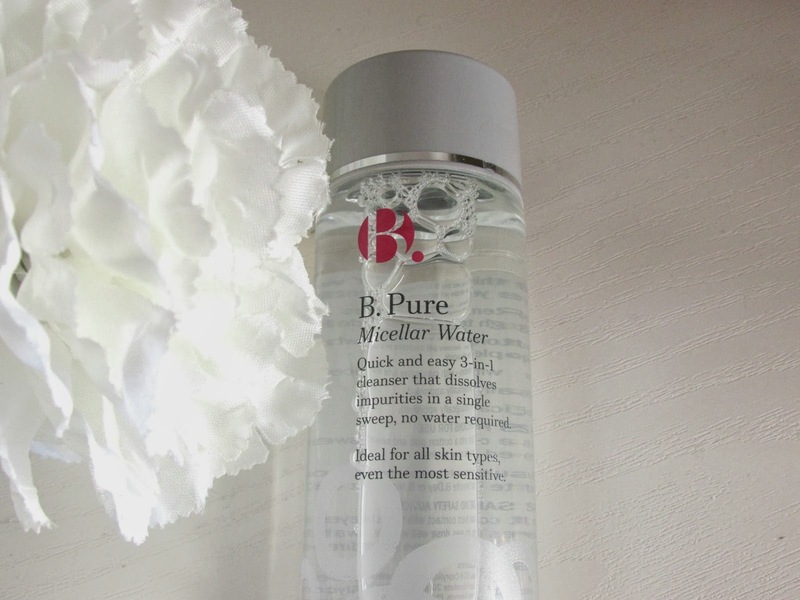 This product is also a toner and restores the pH balance and keeps your skin feeling supple too. Lastly and probably my favorite aspect of this product is how refreshing it feels on your skin. This is thanks to the cucumber extract within the water. Now normally because of how refreshing this product usually is you would expect it to have a slight scent of cucumber which it does but the scent is very light indeed. That isn't a negative at all as normally with products like this I don't like really overpowering scents so if you're the same you'll love this. I apply the water to 2 cotton wool pads to remove the make up on my face excluding the eyes and I have found this to be very effective. I will then take 2 more pads and use one on each eye to remove the last of my make up and voila I am done. Takes less than 5 minutes and your skin feels clean and refreshed afterwards. So, have I tempted you into buying this product? It is absolutely amazing and if you're like me and have days where you feel a little bit lazy but you still want to take care of your skin then this is the product for you. You can find this priced at only £4.99 from Superdrug. Amazing! Do you use micellar waters? If so which ones? Do you agree with the hype surrounding them?